J Transl Med. 2009 Feb 20;7:15. 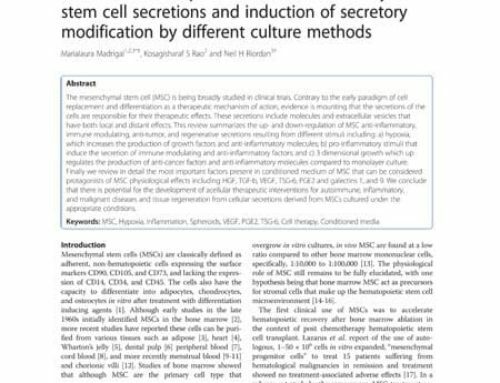 Zhong Z, Patel AN, Ichim TE, Riordan NH, Wang H, Min WP, Woods EJ, Reid M, Mansilla E, Marin GH, Drago H, Murphy MP, Minev B.
Endometrial Regenerative Cells (ERC) are a population of mesenchymal-like stem cells having pluripotent differentiation activity and ability to induce neoangiogenesis. In vitro and animal studies suggest ERC are immune privileged and in certain situations actively suppress ongoing immune responses. In this paper we describe the production of clinical grade ERC and initial safety experiences in 4 patients with multiple sclerosis treated intravenously and intrathecally. The case with the longest follow up, of more than one year, revealed no immunological reactions or treatment associated adverse effects. These preliminary data suggest feasibility of clinical ERC administration and support further studies with this novel stem cell type.